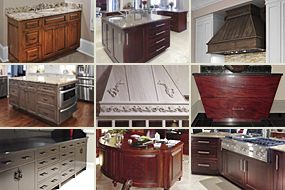 Wood Cabinet Surfaces: As with all wood products, avoid excessive moisture. Liddle Creative cabinetry is designed for use inside the home or other buildings and is not intended for outdoor applications. Once your cabinets have been installed, wipe down all exteriors with a damp cloth to remove dust. Complete a small area at a time and wipe dry. 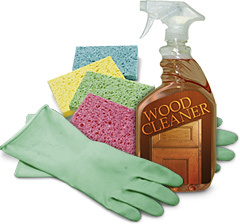 Wood cabinetry finishes may be cleaned and protected by using any commercially available cleaning polish. Liddle recommends an emulsion-type cleaner (such as Murphy’s Oil Soap). These are formulated without wax, petroleum solvents or silicones. The extended use of wax polishes can result in a wax film buildup, while the use of silicone polishes can harm the cabinet’s finish. if swallowed. Use a damp cloth when cleaning Cleaning Agentsnormal household spills. After wiping thoroughly, dry the surface with a lint-free cotton cloth. For stubborn stains, it may be necessary to use a mild detergent with warm water. Always dry the surface immediately. Everyday Care: It is important to wipe up spills and water marks as they occur. Give special attention to areas around the sink and dishwasher. Avoid draping damp or wet dish towels over the door of the sink base cabinet. Over time, this moisture can cause permanent water damage to the door. 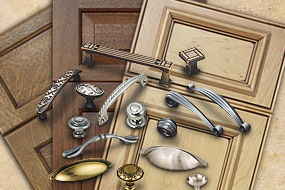 Care & Cleaning of Hardware: Periodically, use mild soap and warm water to clean door/drawer knobs or pulls. Thoroughly dry all hardware joints and surfaces and the surrounding area with a clean, soft cloth. Buff hardware with a clean, dry cloth. Lubrication of hinges is not necessary; however, hinges can be cleaned or dusted using cotton-tipped swabs. Avoid Excessive Heat: Self-cleaning appliances generate intense heat during a cleaning cycle. 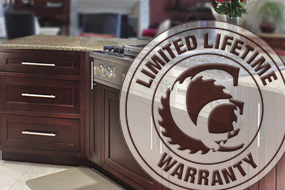 Since the integrity of the appliance seal or gasket may be compromised during installation or with age, Liddle Creatve Construction recommends the removal of doors and/or drawers from cabinets adjacent to or directly above an appliance during a cleaning cycle. This will help prevent possible damage to the finish or surface of these cabinets. Liddle Creative Construction also offers a “heat shield” that may be installed on the side panels of an oven cabinet to help deflect excessive heat from adjacent cabinets. Care & Cleaning of Glass Door Inserts: If your kitchen contains cabinetry accented with glass doors, a few precautions are necessary. Apply glass cleaner to a towel, not directly to the glass. Avoid cleaner contact with lead, white, gold or copper clad mullions. Care & Cleaning of Mirrors: Cleaner should always be applied to a cloth, not directly to the mirror, and should not be allowed to run or drip into the base trim. 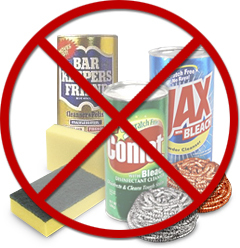 Avoid cleaners that contain sodium hydrochloride, phosphoric acid or sulfur (found in products to prevent mildew and fungus). Hair spray and other hair care products often contain chemicals that are caustic to silver and may cause damage to the mirror back. Do not use abrasives.